Deubel Bicycles engineers and manufactures high performance mountain bike frames - proudly CNC machined and TIG welded in Sydney, Australia. With our extensive knowledge in the mountain bike world we have decided to build a frame that we believe is needed in the current market place. The first 2 years of Deubel Bicycles had us working full-time designing and testing a prototype with huge success. Rider testimonials prove that our engineered design provides increased confidence for any style of riding. Most importantly, whoever tests the Deubel 2UP bike - ends up wanting one! But don't take our word for it - we invite you to test ride the Deubel 2UP and see for yourself! So who are the people behind Deubel Bicycles? As a Professional Mechanical Engineer since 1999, Sebastien's career involved pushing the limits of design to produce outstanding mechanical systems. Some of Sebastien's work includes engine mechanical systems that are currently in use by top car manufacturers today. As a Mountain Bike Rider since 1994, competing in various cross country and downhill events, Sebastien's biggest achievement was 1st place in his category in the 1998 Megavalanche Championships, riding the very bike he designed and built at University. 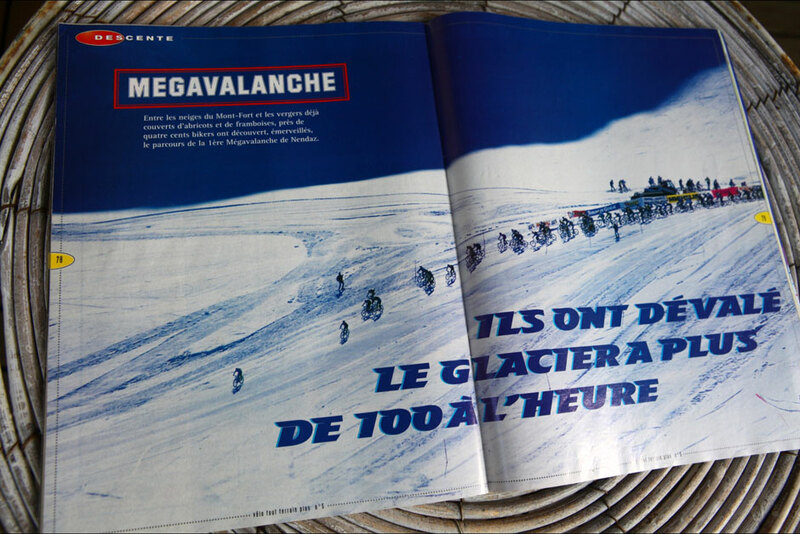 Spot Sebastien getting the holeshot at the Megavalanche in Switzerland in 1997. Take a look at Sebastien riding his bike at 103.7km/h on snow in 2006. Passionate about biking for many years in both cross country and downhill, Gisella offers her entrepreneurial skills.